You see something and tell yourself “This would be a great subject for a photo!”or the opposite “This wouldn’t make for a decent photo”. I guess you all know this. During past months I’ve learned that there are NO unsuitable subjects. You can take a decent photo of any subject you find. It’s only about time and creativity. Now let’s speak about flowers. Some of them are naturally more appealing than others and then it will be probably easier to take a nice photo of them. If it comes to the originality of such a photo, well, it will probably take you a little bit more time to come up with original photo of an appealing flower but on the other hand there are beautiful flowers of which taking original photos isn’t easy at all, for example orchids. And then there are flowers which might not be much appealing, I bet everyone has some. 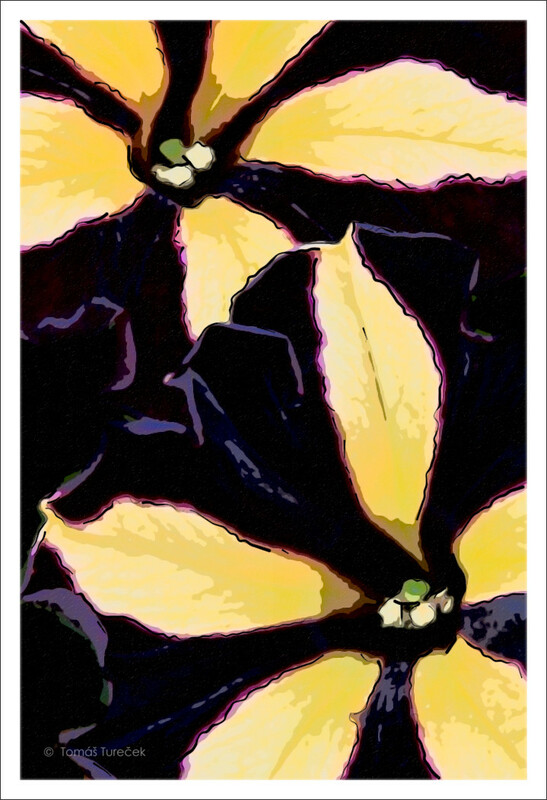 I personally don’t like pansies. They are so fragile, so flat, so… boring! But it’s their season now and so I decided to give them a try. We have 2 colour varieties in our garden and it’s nice that each blossom is a little bit different from others even in one colour variety. I wanted to have an original photo so I was looking for different composition than I saw already on web and I came up with very close close-up. Pansies have nice small details if you take a look at them closely but I wanted something original so I decided to convert photo into painting using Snap Art 2 plug-in for Photoshop. I used “oil on canvas” setting as this matched best to the subject. Click on photo for bigger image with more details. 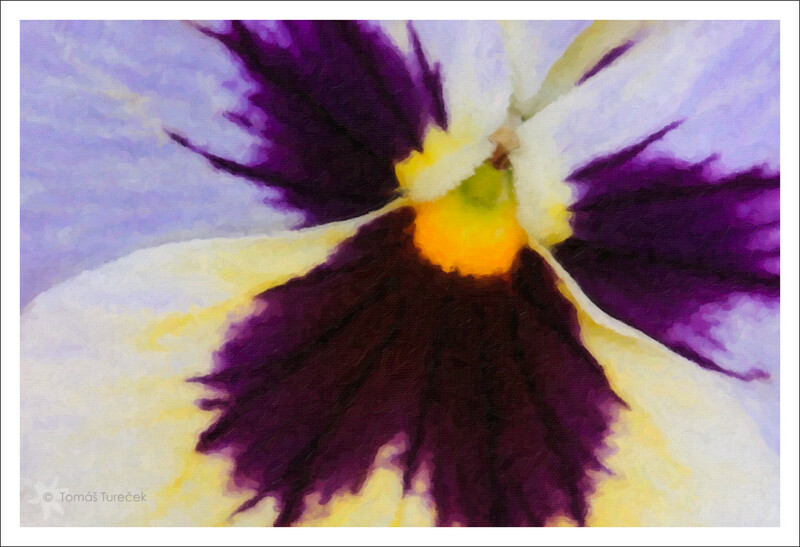 One advice if you decide to photograph pansies, take a fresh blossoms and not after rain otherwise you will spend hours in photo editor cloning out all the specks, especially from dark parts. Another flower which I saw as unsuitable for decent photos is petunia. It nicely beautifies our windows but when it comes to taking nice and original photo of it, well, I didn’t think it will work. 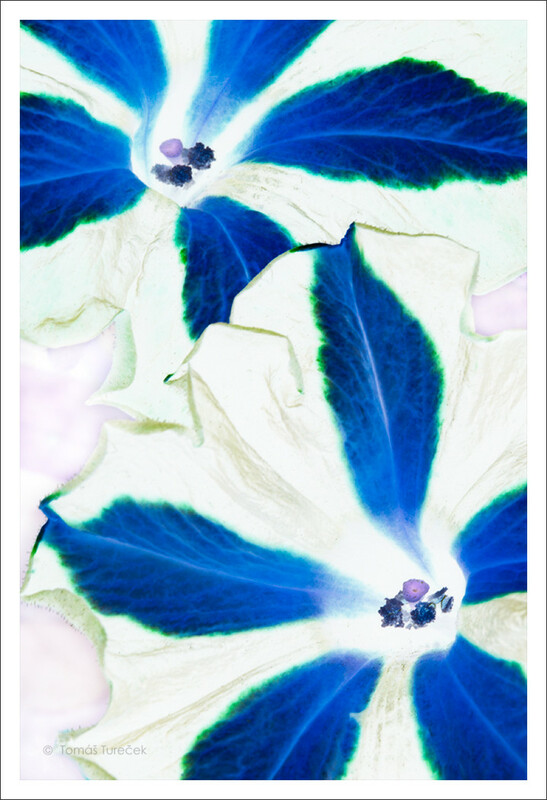 Then I saw a great photo of petunia on flickr and I decided to give them a try. When I started to study the flower closely I noticed that magical deep violet colour which was so rich that it was almost black. It looked so great that I really wanted to have some nice photo of it. It wasn’t so hard to find pleasing composition but as the leaves in background were a little bit disturbing I thought about conversion to painting again. This time “impasto” style worked best so here is the result. Click on photo for bigger image with more details. I think it works quite nicely but when I was in Photoshop I thought that maybe I could try also some other filters (sometimes when working with a photo I simply start to wonder what various filters/presets could do with it. This time I went directly to “invert” filter even though I really don’t know why, it was some kind of intuition and here is the result which really appeals to me. Click on photo for bigger image with more details. Feather was the very first thing which came to my mind when I saw this image. I tried also other filters but haven’t got anything interesting until I went to Snap art again and tried other presets. I used only “impasto” and “oil on canvas” in past because other presets usually results in something not so impressive but this time I really liked result of “stylize” filter which gave the photo a little bit cartoonish style. Click on photo for bigger image with more details. I like all these results and I wanted to share them with you. Here you can see how a subject which saw as unsuitable for good photo may turn up as direct opposite so if you have some subjects which you resisted to photograph so far, give them a chance. I’m pretty sure that you’ll be surprised with your results. Anyway, taking photos of subjects which we see as unsuitable for good photos is great exercise because we need to overcome our bias and think about the subject deeply to be able to work with it and expect good result. If photos in this post will serve as inspiration for you I’ll be more than pleased. Let me know your results! Enjoy your summer holidays and vacations. Technical information: photograph in this post was taken with Canon EOS 450D camera and Canon EF 100mm USM macro lens on a tripod, in natural conditions.